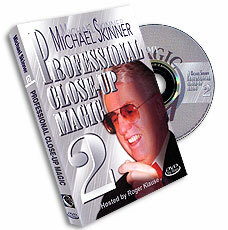 There's a bit of something for nearly everybody on this DVD as Mark explains a varied range of performance magic. 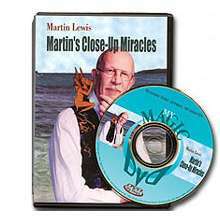 There are effects for close-up, strolling work, stand-up, mentalism, business events and even one routine which he uses for children as well as adults. With such variety on offer, viewers are bound to find at least one item they can use, and in some cases they may discover many! The props required are either readily available or easy to make or collect together, and the effects themselves are entertaining to watch. HOLIDAY - What would happen if a magician was a travel agent? Answer - he would successfully predict both a completely free choice from five airlines and a holiday destination from somewhere round the globe! A fun and fooling effect which is easy to do. MISSING THE POINT - A bill is wrapped around an examined plastic membership card and then a needle is visibly pushed right through both. Having displayed it both sides, the needle is removed leaving the bill with two holes, yet the card completely unharmed. Very cunning method. ARE YOU A WINNER? - A highly versatile, simple effect using just six cards which can be adapted to many different types of shows, including trade shows and product launches. As used by Mark in his own commercial work. 1-2-3 JUMBO CARDS ACROSS - Really easy Cards Across effect using just six jumbo cards and two window envelopes. Great for stand-up shows, plenty of audience participation. A classic ?packs flat, plays big? type routine. SILI-COIN CHIP - Five coins each have a different colored sticker attached to them. The performer removes one sight unseen and places it into a brass box. A spectator then manages to read the performer's mind and accurately reveals the removed color. COUNTDOWN PREDICTION - A clear example of presentation counting for much and method for little. A spectator eliminates cards from a deck in a random manner and yet the very last card matches a jumbo prediction which has been in view at all times. Very easy to do. MY CARD, SIR (VERSIONS 1 AND 2) - It's great to be able to incorporate your business card in a surprising way in your tricks and here, Mark reveals two quick simple effects which leave your business card in a spectator's hand at the finish. THE MAGIC RING - A real stunner! A spectator pushes a ring onto the performer's ring finger and then holds the end of that finger while a handkerchief is draped over the top. Reaching underneath, the performer magically removes the ring leaving the spectator holding the now ringless finger. Great strolling trick. DIARY OF A NOBODY - The Mark Leveridge version of the classic Danson's Diary trick. Only one deck and one diary used. A selected card not only matches the one written next to the spectator's birthday date in the diary, but also turns out to be the only card in the deck with a red back!